This week is cat week in the Scrappers Delight horizontal digital planner. As you can see I am still using the horizontal layout. I always like to give a new layout at least a months trial before I make any decisions on liking or disliking. 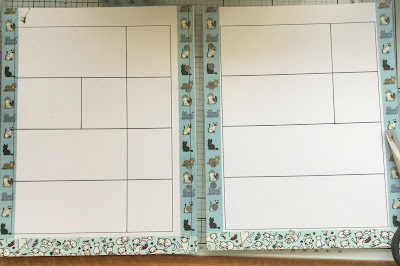 Being a keen cat person this image seemed like an ideal starting point for a cat related spread, and I rather thought I would show you how one of these spreads come together. 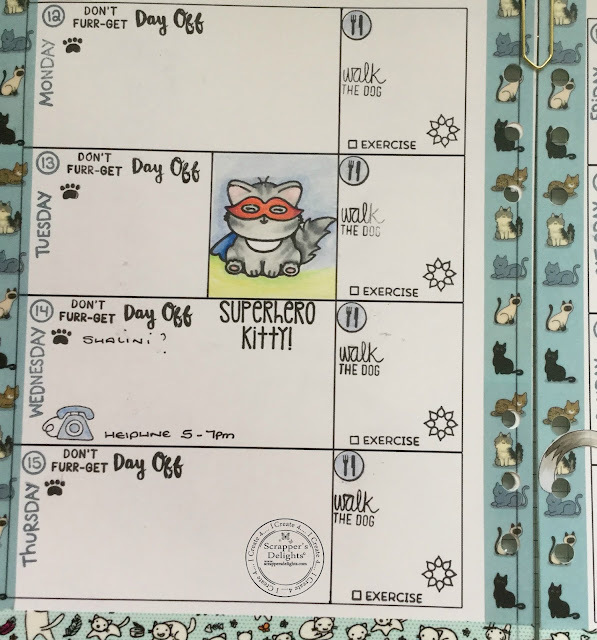 If you are a cat loving planner girl why not check out `kittens who plan` on facebook....kitties and planners my two favourite things. So, first of all I coloured the image using alcohol pens (copic) on sticker paper. This was cut close to the image using sharp scissors. 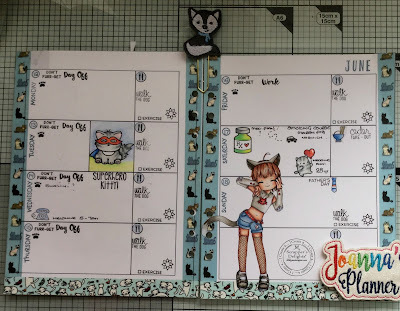 Then using the basic planner page the image was moved around to find the best place. 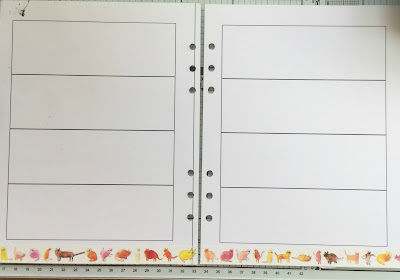 The basic planner page looked like this before starting. 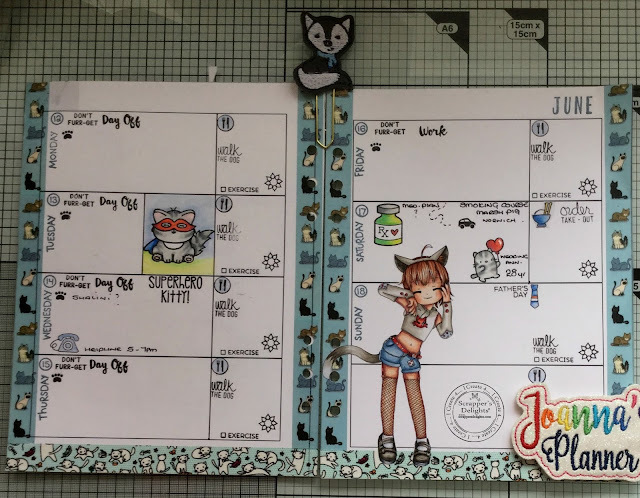 Once a decision was taken regarding placement of the E-Meow girl it was time to add to the basic frame work by ruling and adding lines and by stamping in the days and dates. 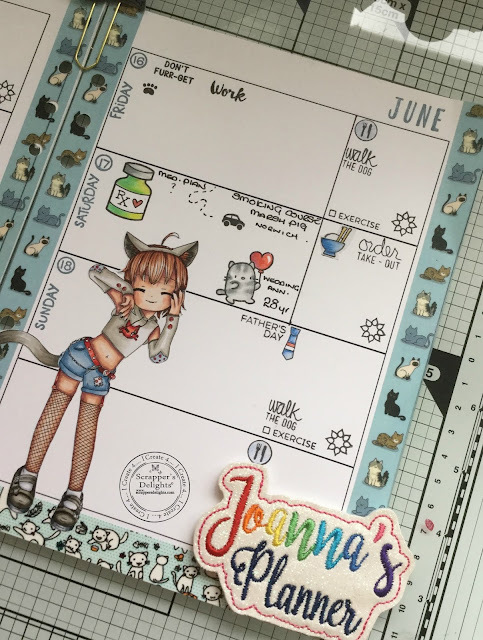 Although these could be added digitally before printing off I still like to use stamps so that the ink colour can be changed to coordinate with decoration. Hobbycraft. You can see I changed it from the original watercolour cats which although I like it didn`t work as well as I would like with the colour scheme I had chosen. The blue cats along the bottom are from the Scotch range of tapes and the blue vertical cats are from Hobbycrafts own range of washi tapes. Not actually too bad for a UK product . As you might spot I also ruled of a separate box for superhero kitty...I had in mind that I was going to feature a smaller kitty and I love these kitties form Sweet Stamp Shop..I still need to get Tax Kitty but as my tax returns do not have to be done until the end of the year there is no hurry for that one. And then it was on to functional stamping. I am on a bit of a health kick right now and I am trying to get some exercise in on a daily basis...Star charts for adults work too. I have some tiny paw prints I will award myself if I actually get around to walking the dog. Please at this point don`t think the dog suffers through lack of walkies. It is actually 14 years old now and very hard to motivate towards a walk unless there is the promise of something ghastly (fox poo) to roll in. 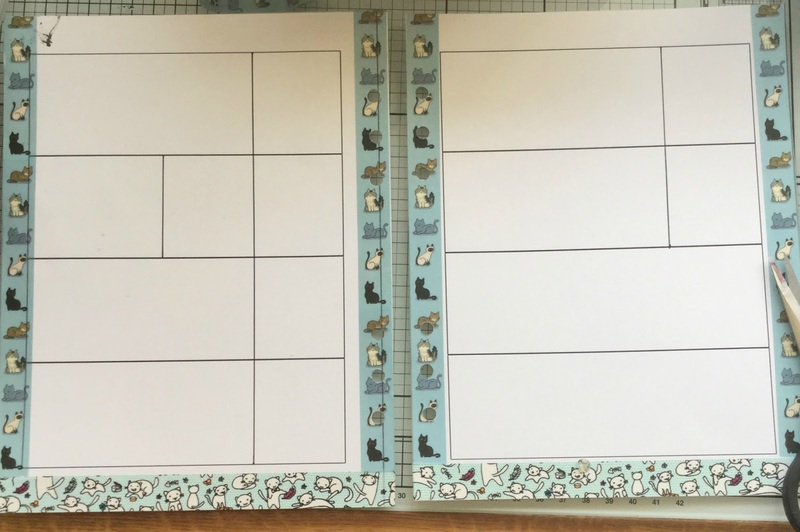 The smaller box to the right of the spread is where I am locating my `health` stamps including meal planning. Planner people if you don`t plan your meals you are really missing out on something. 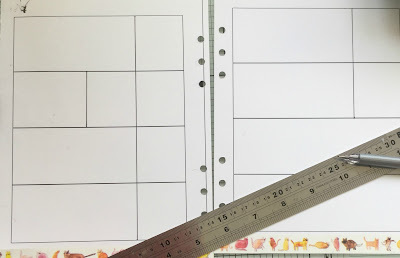 I was just thinking of an increasingly long post but then thought `Meal Planning` might make a good stand alone post....so watch this space. 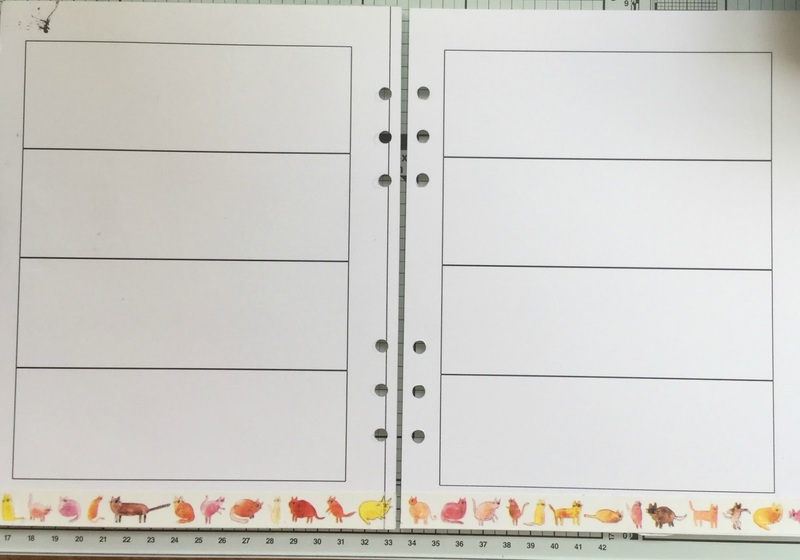 Once the larger stamps are coloured up the planner spread is good to go, providing room for lists, observations and motivational quotes. Just as great a spread as the previous ones, Jo. You're so good at them. 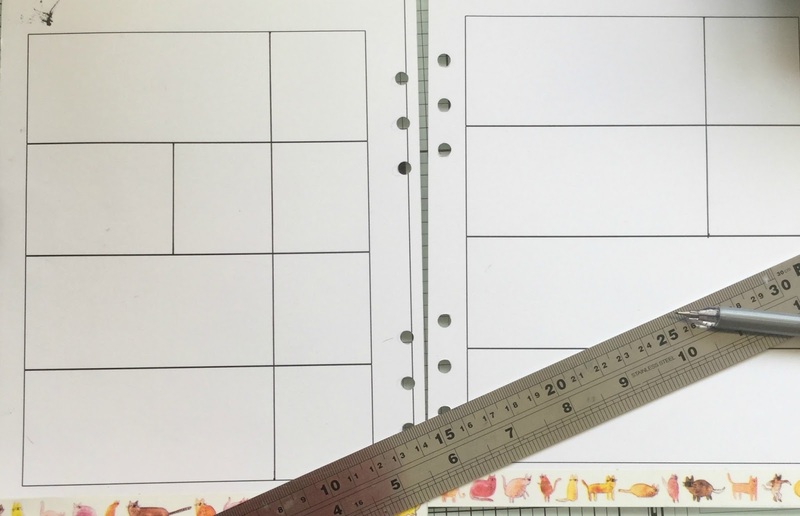 Big thanks for sharing this good post.Love to read this and I am very happy for sharing this with us.most students need several hours of preparation time. So allow structure at start writing.You must start seriously researching and then only start your essay writing works.I’ll bookmark your weblog and take a look at once more right here regularly.Best essay writing service will give you opportunity to spend more free time with friends.